This month we honor our families and others who made the journey from Italy to the United States in search of a better life. We especially honor and remember our maternal grandparents, Urbano Di Renzo and his wife Amelia De Felice Di Renzo (pictured in the photo on the right), who both came to the United States from Abruzzo as young adults in the 1910s, and our father Jerome L. Raffaldini, (pictured far left in the photo on the left), who was born in Mantova, Italy. Our father at the age of 29 visited New York City in 1951 on a business trip. He liked what he saw in New York, including our mother, Theresa Di Renzo (daughter of Urbano and Amelia; pictured with her arm in his in the photo at left), and decided to stay. Our father instilled in us the desire to work hard and follow our dreams. Our widely popular 2015 Sagrantino will be sold out before the end of this month. 2015 was our first year producing a Sagrantino and also happened to be a near perfect vintage. Don't miss your opportunity to own a piece of Raffaldini history. 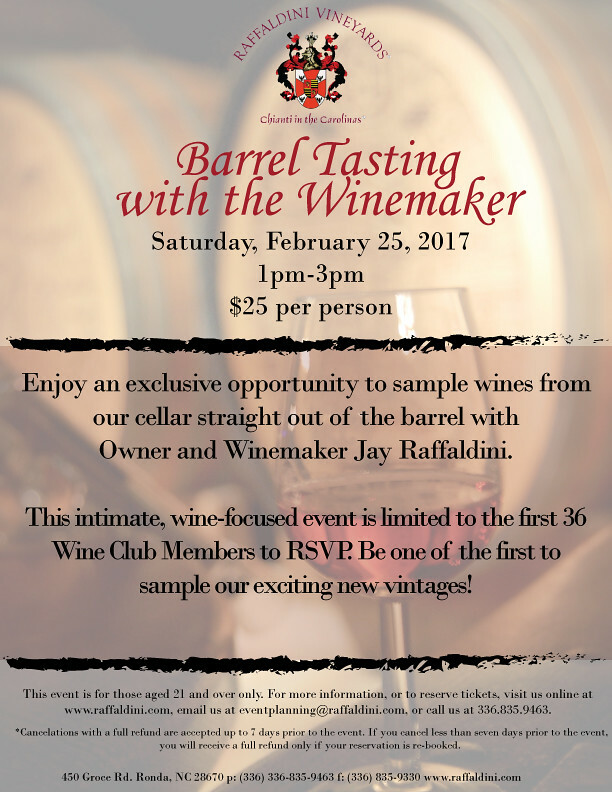 Enjoy a rare opportunity to sample wines from our cellar straight out of the barrel with Owner and Winemaker Jay Raffaldini. Be one of the first to sample these exciting new vintages. Join Owner and Winemaker Jay Raffaldini and long-time NC resident and outdoorsman Steve Nelson as they show you the way through the Raffaldini woods and vineyards. Wear sensible walking shoes and prepare yourself for a moderate, 90-minute hike followed by a hearty luncheon which, of course, includes wine! During the hike, Jay will share details of the vineyard and Steve will share his love of the woods. Ticket includes a guided hike, lunch, and two glasses of wine. Enjoy a traditional, Italian-style afternoon of food and wine as we grill salsicce (sausages), and sip wine at the winery. 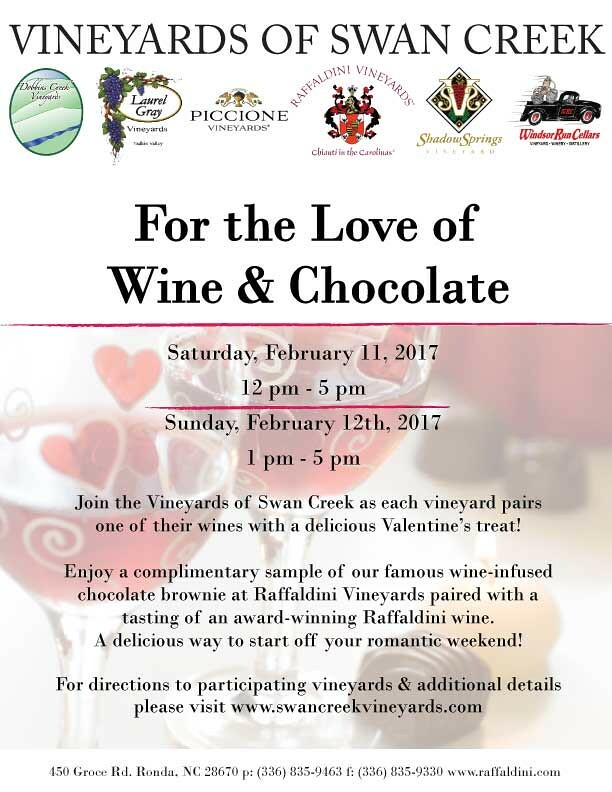 This event is hosted by Owner and Winemaker Jay Raffaldini and will be a relaxed and enjoyable Saturday afternoon. Ticket price is $40 plus tax per person and includes admission, grilled sausage lunch with assorted sides, and two glasses of Raffaldini wine. Greetings Wine Club Members! Fall temperatures are here, and we can now safely ship your wine club package. If you have not yet paid for your Fall Wine Club package and your card is on file with us, we will bill you for the Wine Club plus shipping on Thursday, October 5. If you have already paid to have your Fall Wine Club Package shipped, we will mail it out on October 10th. The Fall 2017 package features three stunning new wines, the 2016 Girasole, 2015 Sangiovese Classico and 2015 Montepulciano Riserva. The Fall Wine Club Package is now available for purchase on our web site. Click the link below to reserve your allocation today. 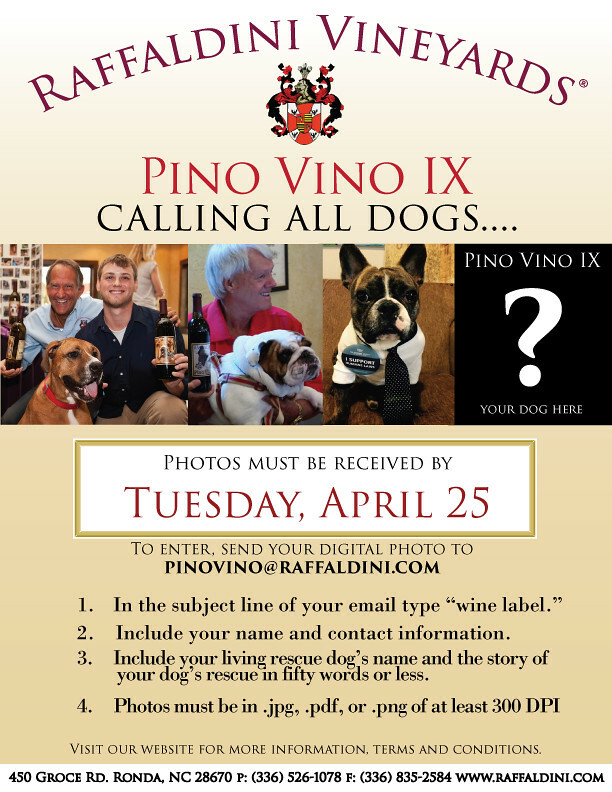 Our reds are ready for blending and we need your help to determine our blend for the Raffaldini Grande Riserva! 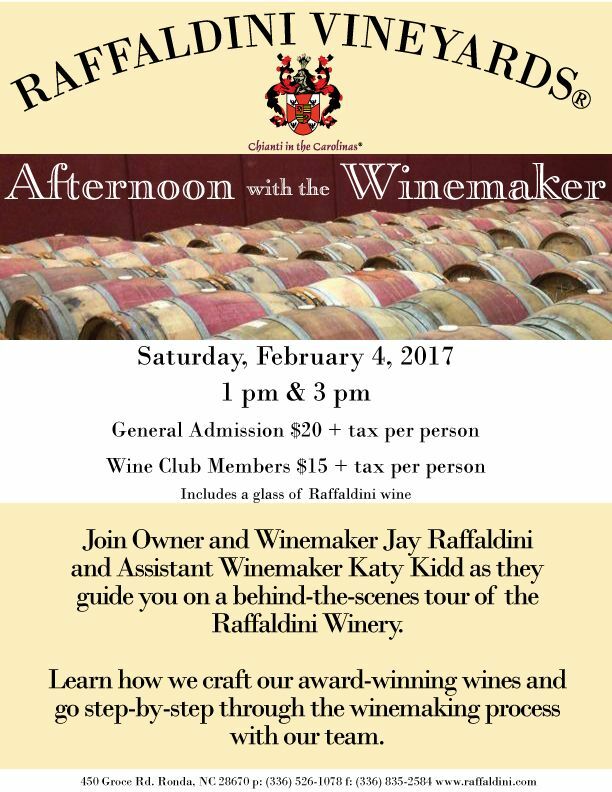 Join Owner and Winemaker Jay Raffaldini in the barrel room for this two-hour, educational and entertaining experience. Discounted admission available for Wine Club Members. 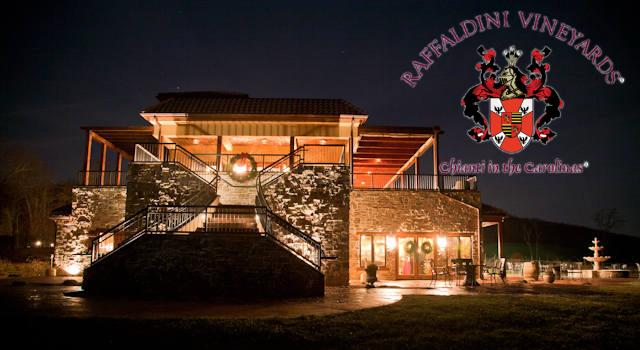 East Coat wine guru Paul Vigna recently sat down with Jay Raffaldini to discuss the journey of Raffaldini Vineyards and the strategy behind his craft in an article highlighting North Carolina vineyards and their pursuit of excellence. Click here to read the article. As nations fought, men chose to share a moment of peace, celebrating their humanity in the worst of tragedies. This new opera, recounting the spontaneous Christmas truce of the First World War, has traveled the globe, and now makes its North Carolina premiere. 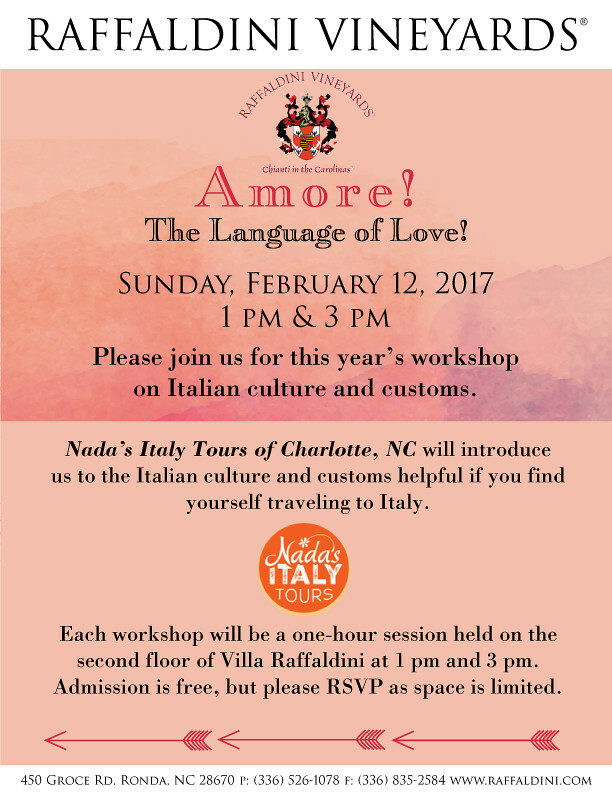 Celebrate All Things Italian with Us at Our Biggest Event of the Year! Last Friday under picture-perfect skies a group of Raffaldini patrons got the experience of a lifetime harvesting and processing fruit from our vineyards alongside Owner and Winemaker Jay Raffaldini and the rest of the winemaking team. The group harvested Sangiovese and Sagrantino and after lunch headed over to the winery to remove the Passito, or dehydrated fruit, from the Fruttaio (drying room) to begin the fermentation process. Then they refilled the racks with freshly-picked fruit ready to begin the Appassimento process. Click here to watch FOX 8 WGHP's coverage of Vine to Wine. Join food vendors, entertainers, artists and friends from across the Southeast for a celebration of all things Italian! Savor a selection of authentic Italian cuisine (scroll down for a list of food vendors) while you shop our vendors for the perfect local, handmade gift. Relax to our selection of live entertainment from musicians and visual artists. Admission is available day-of. The weather for Saturday looks perfect, but the Festa will be held rain or shine. Bring your lawn chairs and blankets. Please no coolers, outside alcohol, tents, or pets. Calling All Wine Club Members - invite your friends and family to join in a day of wine tasting and relaxation at Villa Raffaldini in September. For every new wine club member that is referred, both parties will be entered into a raffle to win tickets to our Assemblaggio! Grande Riserva Blending Trials in November. 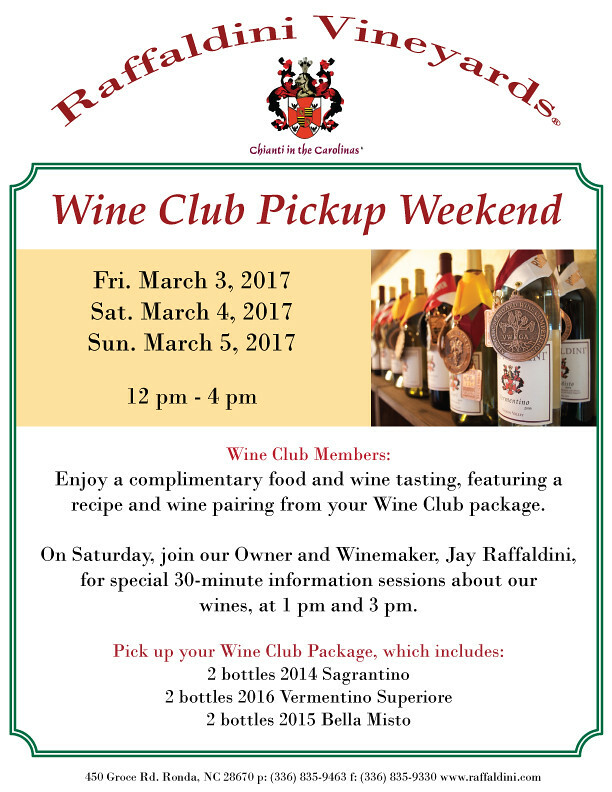 Enjoy a rare opportunity to sample wines from our cellar straight out of the barrel with Owner and Winemaker Jay Raffaldini. This intimate, wine-focused event is limited to the the first 36 wine club members to RSVP. Be one of the first to sample these exciting new vintages. Join Owner and Winemaker Jay Raffaldini and long time NC resident and outdoorsman Steve Nelson, as they show you the way through the Raffaldini woods and vineyards. Wear sensible walking shoes and prepare yourself for a moderate 90 minute hike followed by a hearty luncheon which of course includes wine! During the hike, Jay will share details of the vineyard and Steve will share his love of the woods. Ticket includes a guided hike, lunch and two glasses of wine. Last month we harvested grapes for our inaugural vintage of a traditional sparkling wine called Aguri. We looked at the weather forecast closely to time the harvest for peak acidity and to meet our strict fermentation requirements, since every step of the process requires absolute precision. There is no room for error. Fermentation of the base wines is currently in progress, and we could not be happier with the results. The next phase will include a secondary fermentation in bottle and finish with the disgorgement of yeast to clarify the finished wine. Photo: (Left:) Raffaldini Vineyards' Tasting Room Manager & Media Relations Rep. Thomas Salley Speaks with WGHP's Charles Ewing. (Right:) Gov. Cooper reads aloud the official NC Wine Month proclamation prior to signing. Admission also available day-of. Festa held rain or shine. Please no coolers, outside alcohol, tents, or pets. Exclusive Festa VIP Tables Available - Limited Tables Remaining! 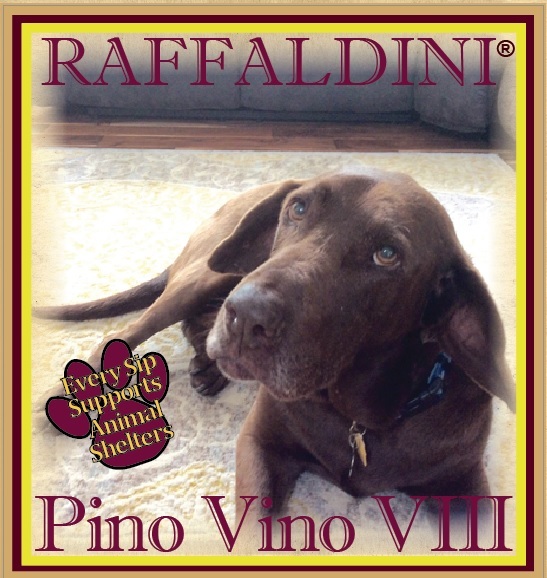 Thank you to everyone who stopped by for our Pino Vino IX Rescue Dog Wine Label unveiling! We are excited to have Bentley as our ambassador for rescue animals everywhere. Pino Vino IX is now available in the tasting room and online. Every sip supports animal shelters! Raffaldini Vineyards is a proud supporter of BOOKMARKS, a literary arts organization that fosters a love of reading and writing in the community. Please click the image to learn more about BOOKMARKS and learn about their Festival of Books and Authors, September 7-10.